Lately, I've been loving statement necklaces. (I *almost* bought one at Nordstrom Rack the other day but resisted because buying a house is scaring me into thinking that I need to save every last penny. sad? yes.) So, instead I've searched the interwebs high & low, looking for some pretty statement necklaces that I can admire from afar. 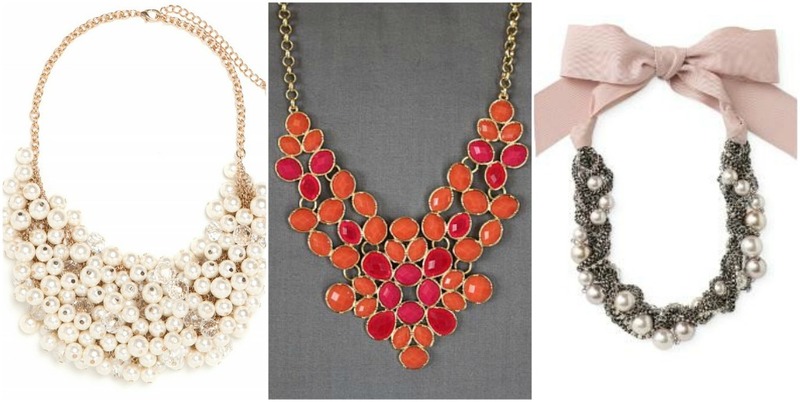 What do you think, would you wear a bold statement necklace like the ones below? I think they're so much fun! You can take a plain outfit & glam it up with just one piece of jewelry! after I get all moved into the new house. Then, hopefully one of these will be mine!! These are gorgeous! I think the first one is my fav! How fun. Perfect for Portland too- you can still wear jeans and a tee but you're fancy because you've got your necklace. LOVE it. I LOVE statement jewellery, especially necklaces. I love your blog, I am your newest follower!! Love statement necklaces and LOVE your new header! So so so cute!! !